Are you a fan of British comedy? 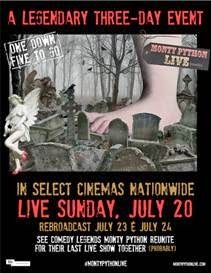 Then you'll love MONTY PYTHON LIVE (mostly)! We have your chance to win tickets for this legendary event at Cinemark Strongsville, Cinemark at Macedonia and Regal Crocker Park Theater. The two encore presentations take place on Wednesday, July 23 and Thursday, July 24. Remember to always look on the bright side of life!